Mo Turner (@PycnoPod) is a Ph.D. candidate in Biology at the University of Washington and Cassandra Donatelli (@CMDonatelli) is a Ph.D. candidate at Tufts University. #ScanAllStars is a play on the Summers Lab project #ScanAllFish (Tide Bite #42, @Fishguy_FHL). Interdisciplinary science is the collision and blending of multiple fields of study, often allowing the researchers to look at a subject from a novel angle. For Cassandra and I, this collaboration was born almost by accident. I have been studying the ecology of sea stars for several years in the Pacific Northwest, from observing population dynamics of stars during the onset of Sea Star Wasting Disease (SSWD) to studying the diet and feeding behavior of our iconic purple and orange intertidal ochre star, Pisaster ochraceus. Cassandra has been doing research at FHL with the Summers Lab for several years, looking at the morphology of anguilliform (eel-like) fishes and how they swim. This involves spending much of her time in the back rooms of Lab 8 running the micro-CT scanner (Figure 1) to look at 3D renderings of the skeletal structures of her fish. Fortunately, the Karel F Liem Fish Biology Endowment supports running the machine at no costs to the scientists using it, which led to Cassandra offering to scan one of my “bugs” (as she calls just about any critter that’s not a fish). Fig. 1: FHL's Bruker Skycan micro-CT scanner. When fish are scanned by the machine without any dyes or treatments, the images produced are skeletal x-rays that can be turned into a 3D image that can be rotated and observed from any angle. What can be seen when scanning an organism that doesn’t contain any bones? For some invertebrates, almost nothing! However, echinoderms have a hard endoskeleton made of thousands of tiny calcareous pieces called ossicles. Having dissected several sea stars in the past, I had an inkling that the scans would show a dense layer of these interlocking ossicles throughout the body wall, allowing for simultaneous flexibility and rigidity in their skeletal structure. Surprise. As soon as we saw the renderings of the first sea star scan, we knew we had stumbled across something special. First off, the photo was stunning (Figure 2). The ossicles formed a series of organized, geometric shapes, rather than just a random blob. Additionally, the ossicles varied in size, shape and density. This immediately sparked a whole new set of questions! From Cassandra: how does this organization differ between species? Does it relate to the defense of these animals? And from me: does the organization relate to feeding or reproduction? Does ossicle density change with depth or habitat type? In order to answer any of these, we needed more stars! Fig. 2: CT-scan of Leptasterias spp., the six-rayed star. Hurdles. Since we’re using a micro-CT scanner, we are limited by the size of stars that can fit into it. Although some local sea star species are about the size of a half-dollar coin when full grown – such as the six-rayed star (Leptasterias spp.) and some of the blood stars (Henricia spp.) – other species can exceed the diameter of dinner plates (Solaster spp.) or even bicycle wheels (Pycnopodia helianthoides). Specimens are prepared for the scanner by wrapping layers of organisms in cheesecloth and packing them into a hollow 3D-printed cylinder (Figure 3). While this may work well for your average fish, the shape of a sea star is not conducive to being placed in a cylinder. This meant that we had to find stars that are the size of the palm of your hand or smaller in order to properly wrap each sea star “burrito” to be scanned. Fig. 3: Preparation of sea stars to be placed in the CT scanner. From left to the right: (1) the stars are labeled with unique tags before being (2) wrapped in cheese cloth to prevent movement during the scan and to create separation between stars so as to be able to digitally separate the pictures. Finally, (3) the cheese cloth burrito is placed in the hollow cylinder to be mounted in the scanner. Although we were both jazzed about this project, we were both also in the middle of our own dissertations, so for the next year I collected stars when I happened upon individuals of the appropriate size. By the next summer when Cassandra returned to FHL, I had collected 9 different species. Star diversity. After scanning the stars, Cassandra used Dataviewer and Slicer 3D software to segment the scans the render the 3D images. In addition, she was able to coordinate the colors of the images to show relative density of the individual ossicles across all nine species (Figure 4). 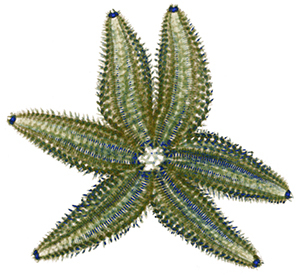 Not surprisingly, the sunflower star (Pycnopodia helianthoides) had the smallest average ossicle density relative to the other sea stars. This species is the only star of the nine scanned that relies on hydrostatic pressure rather than the organization of the ossicles to maintain its body shape, drawing extra water into itself to “puff itself up.” This greatly increases its flexibility and potentially allows it to be lighter and faster as it chases its prey. Across most of the stars scanned, the most dense ossicles were typically found in areas that could be considered the most vulnerable to the star: the ambulacral grooves, arm tips and mouth/stomach. The ambulacral grooves are the “valley” regions on the underside of the star from which the soft tube feet protrude. Each arm tip runs the risk of being the first thing to hit a potential hazard as they’re crawling along the seafloor, as well as also containing eye spots to assist in navigation. During feeding, the soft, fragile stomach is often completely everted through the mouth to digest food from outside the body, leaving the area vulnerable and attractive to predators. Fig. 4: CT scan of 9 different species of sea stars from the San Juan Islands, WA. From left to right, top: Evasterias troschelii, Pisaster ochraceus, Leptasterias spp., Mediaster aequalis. Middle: Dermasterias imbricata, Pteraster tesselatus, Solaster stimpsoni. Bottom: Pycnopodia helianthoides, and three individuals of Henricia spp. Colors show relative density of individual ossicles: blue is most dense and light pink is least dense. Slime. 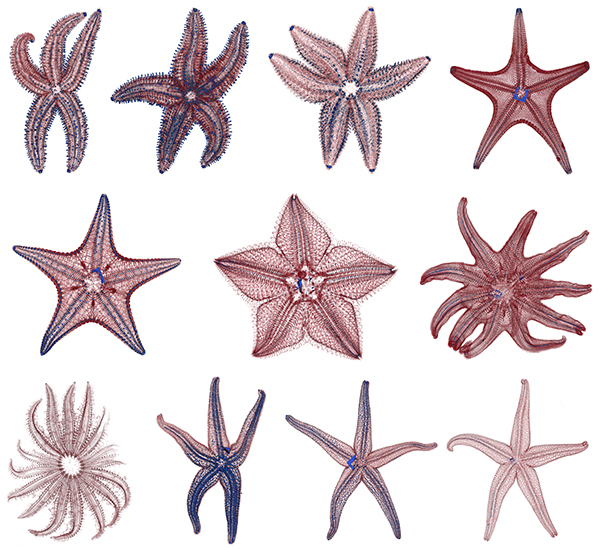 Perhaps my favorite pattern that jumped out at us was the jack-like shape of the ossicles in the slime star (Pteraster tesselatus). This star is notorious for its ability to extrude immense amounts of slime when disturbed. The slime itself is rapidly formed within the body cavity as the star stretches and expands (as if taking a deep breath), and then the body contracts, pushing the slime out through its porous skin. As the body contracts, it appears that the jack-shaped ossicles are positioned in a way that they can fold into each other like puzzle pieces. Expansion. Cassandra wrote code that modified 2D fractal analyses into 3D, to give us the fractal dimensions of our star scans. We presented the preliminary findings on ossicle density and fractal dimensions at the Society of Integrative and Comparative Biology (SICB) this January and were met with great excitement and a myriad of new ideas (Figure 5). As this next field season approaches, we intend to hone our questions and increase our sample sizes. How much variation in ossicle density/fraction dimension do we see within a species? Does this change with age of the star? Can we predict habitat quality for a particular species based on its ossicle organization? Fig. 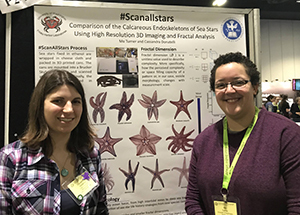 5: Cassandra (left) and I presenting our sea star findings at the SICB meeting, January 2019. Adam Summers says that the best collaborations happen when it’s easy for everyone: when work doesn’t feel like work, you never feel like you’re contributing enough, and you find yourself wanting to do more. We heartily agree and are excited to see where this takes us. Look for Tide Bites in your inbox at the start of each month!